Some digital genius in New York is trying to hitchhike his way to glory on the back of my Top 10 Double-Secret Unknown Facts About Advertising. He claims to refute "every one" of my 10 points. What he is actually doing is not refuting the facts at all, but creating the usual excuses and explanations and digressions to account for the facts. First he spammed my blog with a link to his brilliant post. Then he started sending out tweets saying I was wrong. Like all of his ilk, he talks about everything but the point. He gives us his opinions and his analysis and tries to blind us with off-the-point sidebars and data that isn't quite relevant to refuting the facts I quoted. He accuses me of fudging. Normally, I don't bother answering annoying gnats, but this guy accused me of cheating. I spent a lot of time on this and was painstaking in getting my sources. For the record, just so people aren't taken in by this guy, here are the facts I stated in "Top 10 Double-Secret Unknown Facts About Advertising" and the sources for them. Fact #1) 99.9% of people who are served an online display ad do not click on it. "Flash, and rich media campaigns are as follows: Click-through Rate (CTR) 0.10%"
Fact #2) TV viewership is now at its highest point ever. "For the 2008-2009 TV season, the amount of television watched reached an all-time high as Americans spent four hours and 49 minutes a day on average in front of the TV, up four minutes from last year and up 20% from 10 years ago. The average household watched eight hours and 21 minutes a day on average, also at an all-time high." "The amount of time spent watching television is still increasing: viewers watched two more hours of TV per month in Q1 2010 than in Q1 2009"
Fact #3) 96% of all retail activity is done in a store. 4% is done on line. "E-commerce sales in the first quarter of 2010 accounted for 4.0 percent of total sales." 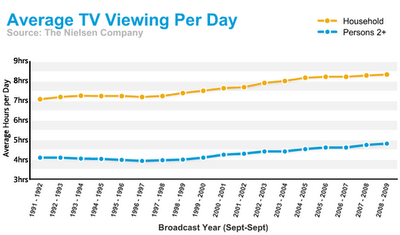 Fact #4) DVR owners watch live TV 95% of the time. 5% of the time they watch recorded material. "TiVo households still watch the huge majority (95 percent) of their TV live, meaning few commercials can be skipped." Source: Journal of Marketing Research, Dec. 22, 2009 "Do DVRs Influence Sales?" "We find that 3,486 of the 70,389 shows watched (5%) were viewed after being recorded." Fact #5) 99% percent of all video viewing is done on a television. 1% is done on line. Fact #6) The difference in purchasing behavior between people who use DVRs to skip ads and those who don’t: None. "In partnership with Information Resources Inc. (IRI) and TiVo, Mela and colleagues from The University of Chicago and Tilburg University conducted a multimillion-dollar, three-year field study in which some households were given a DVR and their shopping behavior was compared to those without one. The authors tracked purchases of new products, advertised products and store brands across 50 categories as well as the viewing behavior of those with the DVRs. No matter how the researchers looked at it, DVRs did not affect what people bought. This conclusion astonished the researchers." Fact #7) Since the 1990s, click-through rates for banner ads have dropped 97.5%. 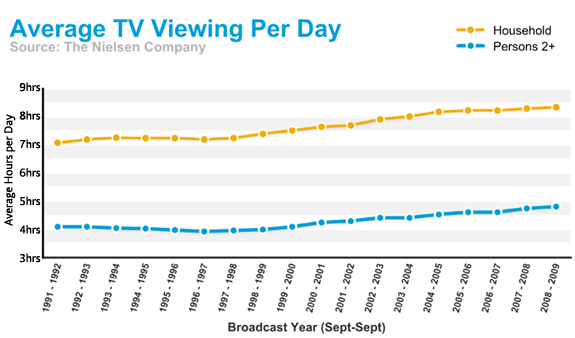 Fact #8) Since the introduction of TiVo, real time TV viewing has increased over 20%. Fact #9) Baby boomers dominate 94% of all consumer packaged goods categories. 5% of advertising is aimed at them. "Nielsen's research says Boomers dominate 1,023 out of 1,083 consumer packaged goods categories...Nielsen estimates that only 5% of advertising dollars are currently targeted toward adults 35-64 years"
Fact #10) TV viewers are no more likely to leave the room during a commercial break than they are before or after the break. "A similar pattern emerges with room changes: 19% change rooms in the four minutes before a commercial break; 20% during; and 21% in the four minutes after programming returns." Once again, let me state what I've stated a thousand times already. I have nothing against the web. As a matter of fact I am a web junkie. What I try to expose in this blog are the outrageous claims and misleading data of web hustlers. There are very few activities more hopeless than trying to talk dispassionately to a true believer.